The Godfather of the Inner Harbor. In 2007 I began a project that would engage me for a year and alter the way I view the world. I was living in Baltimore. It was winter, and so cold that on the night of December 4th two men died of exposure on Pratt Street, a major downtown thoroughfare. Reading of their deaths in the morning paper, I wondered: how it is that people freeze to death in the country’s 9th largest city? I set out to understand. 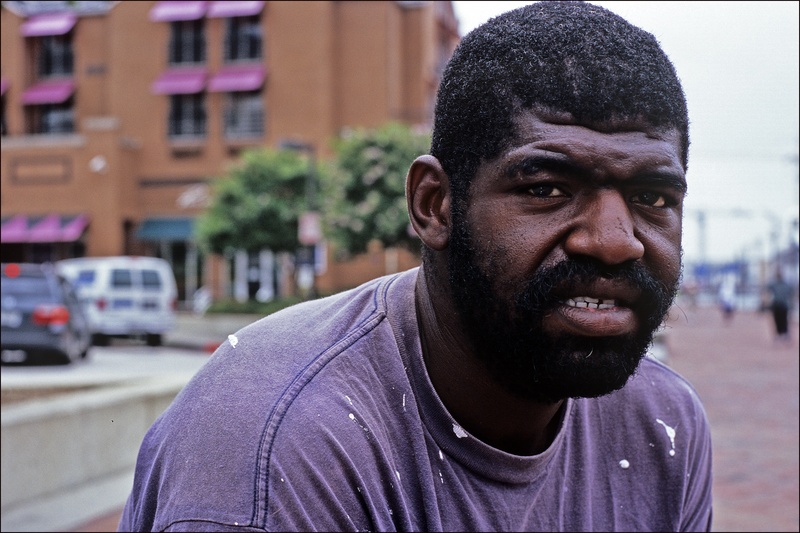 Consequently, I spent a year photographing and interviewing men living on the street. The project came to be called The Gentlemen of Baltimore. Indeed, they were gentlemen. One at a time, over many months, I sought them out. They were kind and generous and intent on an earnestness that surprised me. They sat with me and allowed me take their photograph and they answered my questions. The project was exhibited on two occasions and I was invited to present before audiences interested in the nature of urban street existence. A portion of the effort–I did 100 interviews–became part of the permanent collection of the University of Maryland. I chose to do the project straight up; that is, a simple headshot and a transcription. My questions likewise were simple: “How long have you been homeless?” “How did this happen?” “Do you have any family?”– and so forth. The quotes that accompany the portraits are verbatim. I thought it might be of interest to occasionally share a story from the project. Allow me to introduce Lonnie. Thanks, Sherry. Well then, we seem to be drinking from the same pond: travel, dogs and now this topic. Thanks for reading and commenting. I appreciate it.